If you’re in the design space, you’ve probably heard the acronym CTA. While it sounds like a disease, CTA stands for “Call To Action.” It’s a button or a link that users can interact with in order to inform or convert them to make a buying decision. Marketers love to throw out phrases like “We need a strong CTA” and we’re here to discuss what that even means. A typical call to action you see on eCommerce websites are the “Buy Now” and “Click Here” boxes. Although it depends what your goal, product, and demographic you’re targeting is, there are some common denominators every CTA should have. Here’s a checklist to make sure you’re maximizing conversion every time. First, a strong CTA should be easy to see and should have a prominent placement. 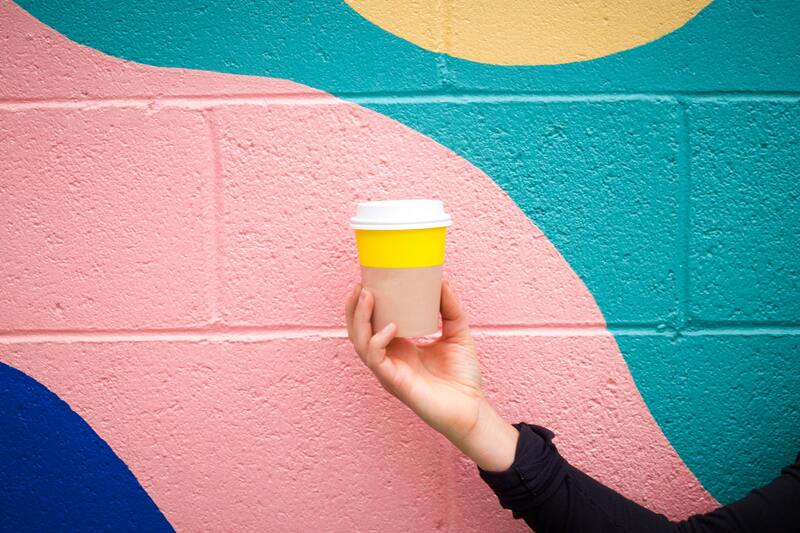 Although some may think size and color are the most important factor of a CTA, it’s about what’s happening around the space that you need to be conscious about. Think about the button in context with the page. If you have a CTA with pictures all around it it’s going to be hard for the human mind to see it. A CTA with clean boundaries is going to get more clicks. General rule of thumb is to make sure the color is vibrant. Websites with a black box and white text may not perform as well. 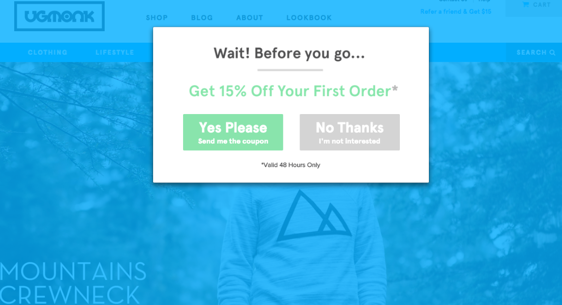 A colorful button that stands out in the design will attract more clicks. Be wary of going overboard. If you have a website that has colorful text, design, links, and you have a colorful CTA, it’s going to get lost in the composition. 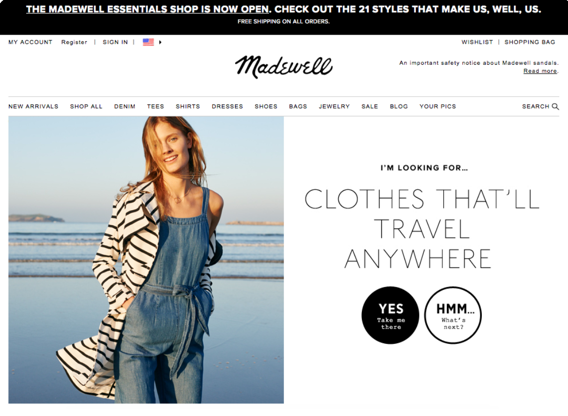 This Madewell CTA could have been more impactful with color differentiation. Due to the black and white, the user has to stop and read both buttons to make a decision instead of making a subconscious choice. For example, a “yes” button being green and a “no” button being red. In this example, the designer uses green and grey to differentiate. As a result, the user gravitates towards the green “Yes” intended to capture the greatest conversion. Your main CTA should be fairly large. Not large enough to be be obnoxious, but it should be larger than most of the items on the page. For example, on your typical landing page you’ll have title, subtitle, some text and two CTA’s. Typically, those CTA’s like “buy now” or “learn more” have a greater emphasis on them then the rest of the items on the page. The main CTA like “buy now,” should have a heavier weight due to it being the button that will lead to greater conversion and monetization. Additionally, having a sub-CTA like “learn more” is important for those who aren’t ready to buy in the moment, but maybe want to buy in the future. In the context of this example, your main CTA “buy now” should be stronger than the sub-CTA intentionally. If they’re both the same weight then the mind will have to differentiate between the two. If the “buy now” is stronger, it will get more clicks. Most importantly, designing an effective CTA is the difference between converting a customer or generating a lead that will become a customer later on. It’s an integral part of digital marketing and user interface design. With the these tips, you’ll be able to design a CTA that’s effective and engaging. Are you a business owner or entrepreneur that needs help deciding on which applications are best for your business? Let us help get you get #JungleReady. Let our CreateApe expert team be your jungle guide. We will help you traverse the wilds as we take your project to new heights.